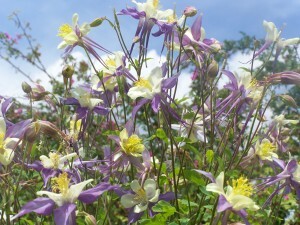 “Sky Full of Columbines” (c) K. Adams. The columbine is Colorado’s state flower. In Colorado we are beginning to experience the quickening of damp earth and swift streams as February’s ice is released. It brings optimism, deep breaths of sunshine, and relief. I love to visit this poem every springtime as an opportunity to give thanks for the “underground stream” and to anticipate the surfacing of that which has been living out of sight within me. I invite you to join me in the exploration. whatever it says is my answer. Read the poem aloud, more than once if necessary. What is the emotion that surfaces for you? What does this poem evoke in you? Describe it. Where in your body/heart/mind/soul might you need a little thawing, some free-flow? Think about a situation in your life that feels frozen, stuck, immobile. Imagine that you can feel into the “comings and goings from miles away” that are working underground, beneath the surface, past the obvious. What shifts for you when you think about the hidden, even invisible, process that may be at work?